Barbara is well known for her work as an astrologer, especially for her groundbreaking study of Chiron. 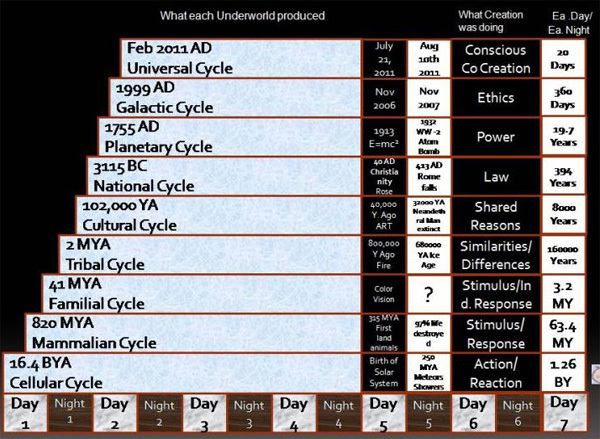 In light of the building galactic alignment, she has written "The Mayan Code: Time Acceleration and Awakening the World Mind" based on Carl Johan Calleman's Mayan Calendar hypothesis and her own study of Earth's alignment with the Galactic Center in 1998, which intensified time during the Galactic Underworld-1999-2011. Barbara Hand Clow returns to discuss the 7th and last day of the Mayan Calendar, the universal underworld and the recent finding of gamma-ray energy bubbles at the center of our galaxy. Topics discussed: dreams, Galactic Center, energy, white hole, South Equatorial Belt of Jupiter disappears, Chiron Neptune conjunction, Day 7th, Universal Underworld, Dr. Alexei Dmitriev, bubble of energy, dark energy, dark matter, emergence of a white hole, transfiguration of our species, spiritual awakening, time acceleration, lines of consciousness, lines of times, technological global consciousness, Portugal, changes in structure and politics, time acceleration, Ian Lungold, world mind, willpower, Millennium films series, evil, abuse, tax dollars and war, masculine and feminine aspects, Afghanistan, oil, energy, official disclosure, Earth quarantined and more. Earth Passing Into the Cosmic "Energy Cloud"